I'm not sure why I didn't have to beat boys off with a stick in high school. Especially when I wore this hot and I do mean HAWT jacket. I bought it at the Weathervane. Do you remember that store? When I was in high school and making a little money working for my dad, I thought buying my clothes there was hifalutin shopping. No more Bradlees and Kmart for me! I thought it was so trendy. It's probably the only time in my life I thought I was actually fashionable. And oh, I was so wrong! And there was also a store called Foxmoor. Did you have this store? It was the same kind of store. I guess they would be Forever 21 or Hot Topic today. The biggest difference being the clothes we bought were actually used to cover us up instead of making us look like streetwalkers the way today's clothes do. Not only did I think this was high fashion, I paid handsomely for this jacket! I feel like it might have been $70 in 1990 or so. $70??? At $2 per hour, that was WAY more than I could afford. I heard about this magical thing called layaway and so I jumped onto the layaway bandwagon. Every week, I took my little payment to the girl at the register and eventually, I was the proud owner of this jacket. And every day, as I wore it, I knew I would grow to hate it. I knew that someday, I'd think it was a terrible purchase. I liked it as I wore it, but I definitely knew it was not long for my world. That day came yesterday. My sister a-ster put up a post about a skirt she made for Bean and I thought immediately about a skirt I bought at the Weathervane that had a similar yoke. I loved that skirt. I remember buying it on super clearance in the summer. I feel like it was $9 (major shopping deals tend to stay with me. Where I left my keys? Never. How much I paid for a skirt 20 years ago? Top of the brain). I wore that skirt TO DEATH. It was brown with a slight plaid. Like thin, teal lines, I think. I wore a dreadful peach shirt with it. Seriously, I do not know why I wasn't homecoming queen. As I thought about that skirt and my many trips to Weathervane, it all came crashing back. I would not be caught dead in that jacket today. What on earth was I thinking? The only thing that could have made it worse was if the jacket had leather or suede fringe. Which many of them did at that time. But they were probably $90 (gasp!) and I could not afford that, for sure. That and the fact that though it was worn in the 90s, it is now for sale on ebay as "vintage". 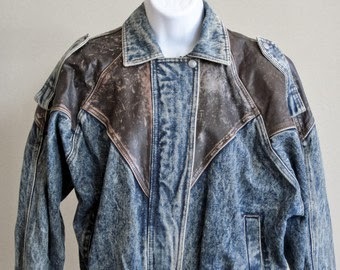 Oh my god - I had almost the same jacket, only it was in hot pink acid wash. Hideous.